A Vokey Wedge Is Simply The Best. The Vokey wedge by Titleist is designed by the master craftsman Bob Vokey. Bob has been working for many years with some of the world’s greatest players to create a Titleist wedge that mirrors what the best desire in a short game club. These high performance products lead the way in terms of look, feel and function. When you are in the market for a wedge it is important to find a club that you find appealing to look at and can trust when called upon. Putting one of these wedges in your bag will fit the bill every time. The finish of the 200 series wedges can be ordered in three distinctly different options: Tour Chrome, Black Nickel, and Oil Can. 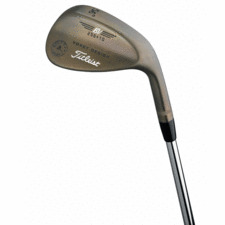 In order to create a soft yet solid feel the wedges are constructed from what is called 8620 mild carbon steel. Each club come stock with a Dynamic Gold S300 shaft and a Titleist Tour Velvet Full Cord Round. The models available include pitching, gap, sand and lob wedges in a wide range of lofts from 48 to 60 degrees and numerous sole and bounce configurations to suit each individual’s game. The Vokey Titleist wedge is designed in a very classic fashion with a teardrop profile, a high toe and shallow heel. Put a Vokey in your bag today and start to experience the confidence around the greens that only the best players enjoy.